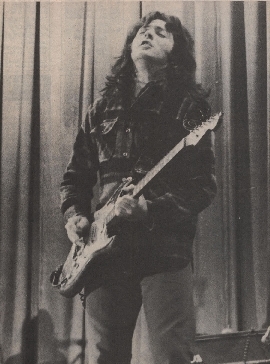 Rory Gallagher claimed not to be afraid of failure in America.... "In fact it didn't even cross my mind, not because I'm big-headed, but because I didn't come out here to fail" the Irishman said hours after he had played his first set before a Boston audience. The concert was part of the Sunset series, sponsored each year by Falstaff Breweries and held each Monday and Wednesday evenings on a fenced-off portion of Boston Common. Before a crow of about 10, 000 it was strange to see Rory as warm-up act to Savoy Brown and Fleetwood Mac. But even this Rory takes with a shrug of his slender shoulders. "That's the way it goes. They have the name from being here before. I only get twenty minutes on gigs like this, but we did a few concerts and I got thirty to forty minutes to do something. When you only have twenty, it's very hard to get across any real impression and you have to belt it out and do the forceful stuff," he said. I never professed to be the greatest lover of Gallagher's music, but he did belt it out and in quick time he had the audience on their feet, which is tantamount to a standing ovation. You could almost feel the frustration as he slipped into his fourth and last number. The band was tight and the addition of Lou Martin on piano filled out what I used to find and aggravating sound. Later that evening in the Fenway Motel we sat and talked. Rory is diffident to the point of being shy, quiet-spoken, but full of assurance now more than ever...."I think we're tighter now" he says. "We used to try and improvise ALL the time, whereas now there is more direction and we know where we're going. In fact, I would say my music is well shaped now. We used to put jazz chords in where they wouldn't fit, like square pegs in round holes, but now it has proper form." "Certainly my music is happier now and it is more to my liking. In the old days there was hassle with managers and that sort of thing, but now I can do what I like, though not in the sense of acting indiscriminately," he went on. Van Morrison made inroads with a bigger band, using horns as well as piano and organ. Was there any possibility that Rory would follow? "I really don't know yet. It might develop. Lou is making a great difference, but as you know, we do acoustic stuff. I would not like to bring in brass, but we're not using it just for the sake of having some there'" he replied. Was it any different without Wilgar Campbell?... "in all fairness to the man, not really. Rod de'Ath who replaced him lived in the same house as Gerry McAvoy and he used to come to rehearsals and a lot of our gigs, so he knew our music. Wilgar was tired of traveling and being away from his wife and kids. He didn't want to be a six nights a week man and I can't blame him." Having conquered England and Europe, America is the only place left for Gallagher to make his mark. Sometimes he regrets he didn't try it sooner.... "People ask if I'm fed up with the domestic market, but that is not why I am here. I should have come here in the old days. Europe is secure now and I suppose that takes a bit if pressure off me. Out here I will have to be patient. I can't expect things to happen right away and don't expect to be all over the papers. I was surprised and delighted though by the number of requests shouted up to me which shows that a lot of people know my records." Rory is far from being complacent, but it seems inevitable that he will become as big in America as he is in Europe. But he doesn't want to be known as the third best guitarist or whatever the popular ratings decide...."I take these things with a pinch of salt. It can put you under a bit of pressure because of what people read. I want to be known as a singer and a songwriter and not just a guitarist, like Bert Weedon, and that was one of the reasons I enjoyed my last Irish gigs. The audiences were between the two extremes and were really attentive." Gallagher like doing gigs where he thinks he has done a good job. He relaxes easily. Later that night we hopped down the street to see Del Shannon wail his way through his oldies. Rory stood at the back of the room, sipped his drink and quietly grooved on what was going on. This time next year, such anonymity will probably be out of the question. Above all else, Rory is still a lover of Ireland and Cork and he talked fondly of school and people and the places he loves.... "I'll definately be buried there. I come home a couple times a year always. Maybe eventually I will be able to spend six months in Ireland and six months wherever else I should be. That would be nice," he said.